I'm letting the pictures do the talking for these bon marche batches. There's one group shot containing all the postcards you'll receive plus an upclose shot or two of front and backsides. Real photos that have been painted by hand . Some of the cards have color stickers verso as shown in the last photo. Most of these cards are pre-WWI. Each card about 3.5 by 5.5 inches. Many uses from scrapbooking, altered art projects to wall art -- a mat and frame does wonders to hide blemishes on antique cards. Or, turn into digital art! Another option: use hole punches and turn the cards into gift tags! These cards range in condition from shabby chic to almost mint. Any questions, feel free to send me a message and I'll reply within 24 hours. But please don't ask me to break up the lots:) It is very time consuming to scan and photograph individual postcards, calibrating the colors to look just right plus writing up an in-depth description with the postal cancellation dates and such. By offering these antique beauties in batches, I'm saving myself lots of time and saving you lots of money! 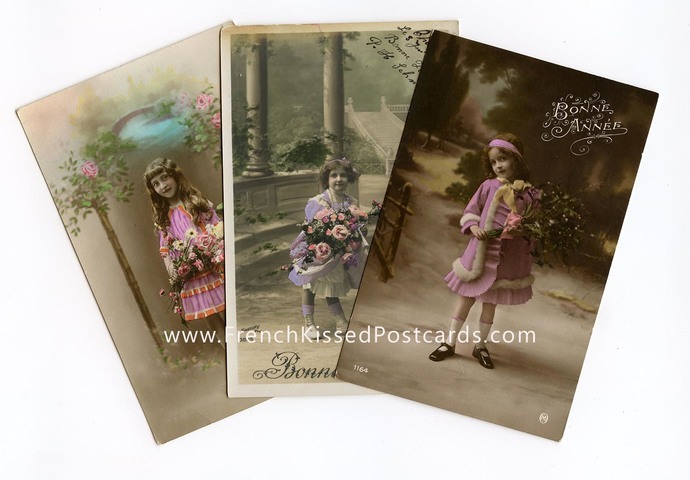 SHIPPING within the US is a flat fee of $3.50 for up to about 70 postcards (so buy several bon marche batches:) and then after that, the rate jumps to priority.